Vincent Paglia represented the United States in last year’s World Championship, taking a celebrated second place finish. He won his way back to this event this year through a Regional in Anaheim, and now he’s up against Pittsburgh native Nate Laufer. Laufer qualified by making the Top 8 at a Columbus Regional several months ago, and both of these Duelists are playing similar Tengu Synchro Decks. A win here for Paglia might set him on his way to another Worlds appearance. Laufer opened the Match with a Set card to his back row. Paglia had Mind Control; Dust Tornado; Debris Dragon; Lonefire Blossom; Glow-Up Bulb; and Junk Synchron. He Summoned Lonefire, then Tributed it to Special Summon another from his Deck. He Tributed that for Dandylion, bringing it out in Defense Position, then Set Dust Tornado. Laufer activated Giant Trunade, and Paglia Chained Dust Tornado to destroy Laufer’s Torrential Tribute. Laufer Special Summoned Paglia’s Lonefire Blossom with Monster Reborn, then Tributed it for one of his own. He Tributed that to bring out his second Lonefire, and used its effect to Special Summon Glow-Up Bulb. Foolish Burial let him send Dandylion to his Graveyard from his Deck, Special Summoning 2 Fluff Tokens with Dandylion’s ability. He Tuned Glow-Up to a Fluff Token, Synchro Summoning Formula Synchron, and drew a card for the Synchron’s effect. Mind Control let him take Paglia’s Dandylion, and he Tuned it to Formula Synchron for T.G. Hyper Librarian! Paglia Special Summoned 2 Fluff Tokens. Laufer sent Cyber Dragon off the top of his Deck to his Graveyard to Special Summon Glow-Up Bulb, and attacked with everything. In Main Phase 2 he Synchro Summoned another Formula Synchron, drawing 2 cards: 1 for the Synchron, and 1 with Librarian’s effect. Paglia drew Solemn Warning. He Normal Summoned Debris Dragon, activated its effect, and Laufer Chained the ability of Maxx “C” to draw a card when Paglia Special Summoned Dandylion! Paglia pressed on, Synchro Summoning Black Rose Dragon: Laufer drew for Maxx “C”, but didn’t get to draw for Hyper Librarian, as it didn’t remain face-up on the field (a must to claim Librarian’s draw ability). Paglia Special Summoned 2 Fluff Tokens, and Set a Spell or Trap. He’d done a nice job eliminating that Librarian and slowing Laufer’s momentum. 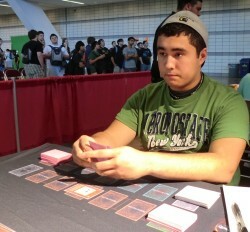 Laufer drew to 7 cards in hand. He Normal Summoned Reborn Tengu, and Special Summoned Chaos Sorcerer by banishing Hyper Librarian and Cyber Dragon from his Graveyard. He activated its effect to banish 1 of Paglia’s Fluff Tokens, then attacked with Tengu to destroy the other. A Set Spell or Trap finished Laufer’s turn. Paglia drew Effect Veiler. He activated Mind Control to target Chaos Sorcerer, and Laufer handed it over. He activated Sorcerer’s effect to try and banish Tengu, but Laufer negated the attempt with Effect Veiler. Paglia Summoned Glow-Up Bulb; Tuned it to Chaos Sorcerer, and tried to Synchro Summon Arcanite Magician, but Laufer stopped the Summon with Solemn Judgment! Paglia ended. Laufer Summoned another Tengu from his hand, attacking with both for a total of 3400 Battle Damage. Paglia drew a Tengu of his own! He Summoned it, slamming it into 1 of Laufer’s Tengus: both Duelists Special Summoned another in Attack Position. Paglia sent his second Tengu to destroy Laufer’s second copy, and his third Tengu crashed into Laufer’s last one: everybody lost all their Tengus. Laufer drew to 4 cards in hand, and activated Pot of Avarice. He sent his 3 Tengus and 2 Formula Synchrons back to his Decks to draw 2 cards, leaving him with a hand of 5 cards total: Paglia had 2 cards in-hand, plus Solemn Warning. Mystical Space Typhoon destroyed the Warning, and Laufer Summoned a freshly-drawn Tengu for another 1700 Battle Damage! Paglia drew Foolish Burial, and activated it to send Doppelwarrior from his Deck to his Graveyard. He Normal Summoned Junk Synchron; used it to Special Sumon Doppelwarrior; and Tuned them together for T.G. Hyper Librarian! That Special Summoned 2 Doppel Tokens, and Paglia Special Summoned Glow-Up Bulb from his Graveyard to Tune it to a Token and make Formula Synchron: he drew 2 cards. From there Paglia activated Pot of Avarice, returning Arcanite Magician; Debris Dragon; and his 3 Tengus back to his deck. This time he drew another Doppelwarrior and another Junk Synchron, adding them to his hand of Solemn Judgment and Effect Veiler. Moving to the Battle Phase, Paglia attacked Reborn Tengu with his Librarian: Laufer Special Summoned another. In Main Phase 2, Paglia Tuned Formula Synchron to Librarian to Synchro Summon Arcanite Magician, and he used its effect to destroy Laufer’s 2 remaining Tengus. He Set Solemn Judgment. Laufer Normal Summoned Debris Dragon; targeted Dandylion; and lost out to Paglia’s Effect Veiler! With 3 cards in hand he activated another Pot of Avarice, sending his 3 Tengus, Effect Veiler, and Lonefire Blossom back to his Deck to draw 2 cards. Debris Dragon attacked over Paglia’s Attack Position Doppel Token, and Laufer ended with a Set Spell or Trap. Paglia drew Reborn Tengu, and Normal Summoned Junk Synchron. He Special Summoned Glow-Up Bulb, then Special Summoned Doppelwarrior from his hand! He Tuned Doppelwarrior to Junk Synchron for another T.G. Hyper Librarian, and Special Summoned 2 Doppel Tokens. He Tuned the Bulb to Arcanite Magician, Synchro Summoning Scrap Dragon, and used its effect to target a Doppel Token and Laufer’s Set Book of Moon for destruction. Laufer Chained the Book, but Paglia negated it with Solemn Judgment! Scrap Dragon and Hyper Libarian both attacked to win the Duel! Vincent Paglia takes an early beating from Nate Laufer’s Maxx “C” and Hyper Librarian hijinx, but he manages to press through a whopping six copies of Reborn Tengu to capture Duel 1! A hardfought effort on both sides of the table leaves Paglia one win away from a 2-0 record. Laufer opened with a Set monster. Paglia’s hand this time around was Mind Control; Spore; Maxx “C”; Lonefire Blossom; Dark Hole; and Call of the Haunted. He Summoned Lonefire, and quickly Special Summoned another, then Dandylion in Attack Position. Dandylion attacked, bouncing off Laufer’s face-down Spore. Paglia Set Call. Laufer bounced the Call away with Giant Trunade, and Normal Summoned Maxx “C”. He took control of Dandylion with Mind Control, and Paglia responded with his own Maxx “C” effect! Laufer Tuned everything together for Iron Chain Dragon, giving Paglia 2 Fluff Tokens, and Paglia drew Thunder King Rai-Oh. Iron Chain attacked a Fluff Token. Paglia drew Caius the Shadow Monarch. He Summoned Spore, Tuning it to his Fluff Token for Formula Synchron and a draw. Mind Control let him take Iron Chain Dragon, and Paglia unleashed Scrap Dragon! He Set Call again. Laufer discarded Dark Armed Dragon to activate One for One, Special Summoning Glow-Up Bulb from his Deck. It was his only move. In the End Phase, Paglia flipped Call of the Haunted to bring back Dandylion. Paglia drew Gorz the Emissary of Darkness, then Tributed his Dandylion for Caius the Shadow Monarch! It banished Laufer’s Glow-Up Bulb, and Laufer immediately offered the handshake. Vincent Paglia is well on his way today, with a 2-0 victory in this Match, plus a 2-0 record in the tournament! “I think this is the first Feature Match I’ve won, actually” grinned Paglia, cheerful as he packed up his cards. Standings after 2 rounds of play! What’s At Stake: The Prizes!